This week Americans got both something good and something bad in their stockings. Personal income and spending both continued to rise smartly, showing more evidence that the consumer has more cash, and the consumer is willing to spend it. The savings rate remained basically steady. I'll have an update on this next week. Durable goods orders fell, but if you exclude Boeing, they did rather well. New and existing home sales remained in the tank, but if you do a YoY comparison with 2008 instead of 2009 (which was distorted by the $8000 housing credit), there was actually a small increase. Consumer sentiment including expectations were at the highest level since June. But there was coal, too - well, at least a different hydrocarbon in the form of Oil, which hit $90 this week, triggering renewed concern about how robust consumer spending can be with this "tax" on consumption. There was also a big lump of coal in the mortgage rate stocking. More below. The BLS reported 420,000 new jobless claims for the second week in a row. 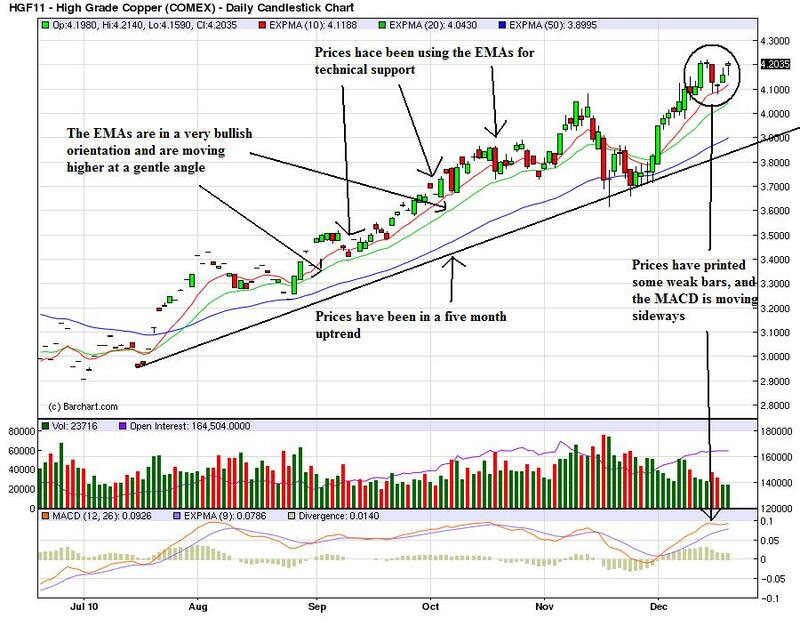 The 4 week moving average rose slightly to 426,000. 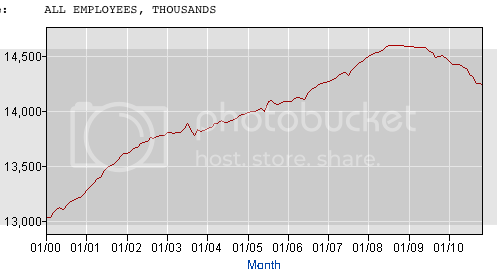 Eight of the last nine weeks have now been reported under 440,000. The issue now becomes, are we in a new range of 410,000 to 440,000, or will the average continue to fall to under 400,000? Gas at the pump reamined at $2.98 a gallon last week. As reported above, Oil breached the $90 a barrel mark. Despite this, gasoline usage was once again about 2% above last year, Gasoline stocks are towards the high end of their normal range for this time of year. The Mortgage Bankers' Association reported that its seasonally adjusted Purchase Index decreased 2.5% last week, but generally has remained stable for the last couple of months, at a rate slightly below the comparable year-ago levels excluding those periods when home buyers rushed to beat the expiring $8000 tax credit. Contrarily, the Refinance Index fell off a cliff, declining for the sixth straight week, by 24.6%! Rapidly increasing mortgage interest rates have just about killed refinancing, and this is likely to have an effect on consumer spending next year. The ICSC reported same store sales for the week ending December 18 increased 4.2% YoY, and increased 1.7% week over week. Likewise, Shoppertrak reported that sales increased 5.5% YoY in the last weekend before Christmas. Most of the retailing reports are indicating that this will end up being a strong holiday shopping season. Railfax remained steady in its comparison with last year. Shipments of waste and scrap metal continue to improve, but auto shipments are significantly below last year. I have no idea why. The American Staffing Association remained at 101 for the week ending December 11. This index will decline significantly over the next several weeks for seasonal reasons, and won't give much reliable information again until January. M1 was down -0.5% for the week and vs. last month, and +7.5% YoY, meaning "real M1" is up 6.5%. 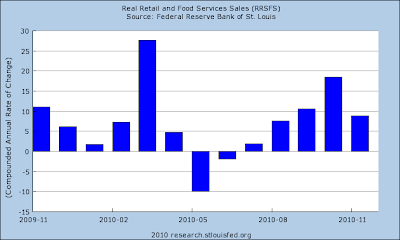 M2 was up +0.2% for the week, up +0.3% vs. last month, and 3.1% YoY, meaning "real M2" is up 2.1%. Real M2 remains stalled without being able to break out of the "red zone" below +2.5% YoY. Weekly BAA commercial bond rates increased from 6.09% last week to 6.18%. 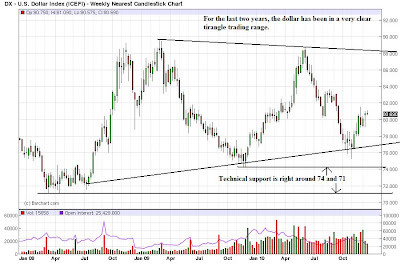 All bonds have come under stress recently, but this suggests investors are "reaching for yield." It's once again worth noting also that bond yields and stocks continue to move in opposite directions, indicating zero fear of a deflationary pulse. The Daily Treasury Statement showed receipts in the first 11 reporting days of December of $119.5 B vs. $105.2 B a year ago, for a gain of close to 14%! For the last 20 days, $146.2 B has been received vs. $131.5 B a year ago, another strong gain of 12%. 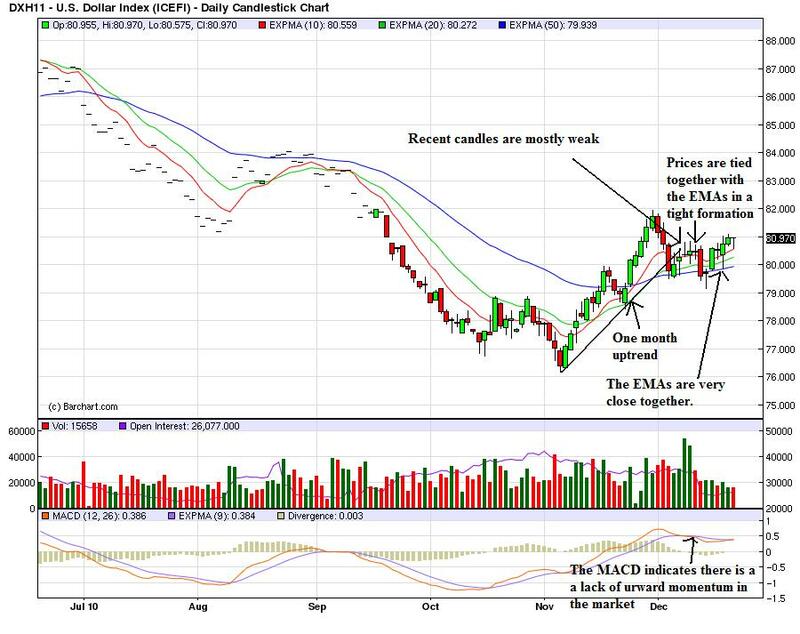 The economy seems to be gaining momentum, which may also explain the steepening yield curve in the bond market. Indeed, so much so that Oil and other commodity prices, and mortgage rates, are once again becoming a "choke collar" on growth. It's the day before Christmas Eve, and things are winding down. Between work and family issues, life has been pretty crazy, so I'm going to wish you all a Merry Christmas. We'll be back on Monday for a holiday shortened week. 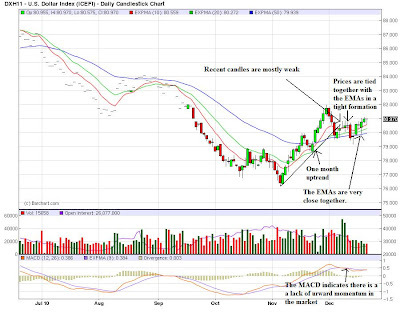 ---- NDD here: I'll put up Weekly Indicators, probably tomorrow. Happy holidays! 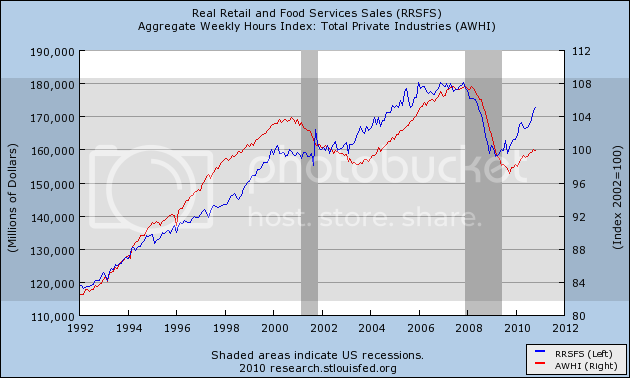 Following up on my last post, I wondered whether the secular shift to hours worked vs. jobs added in recoveries also fit better with the metric of real retail sales. The two series fit like tightly, showing ever so slightly over 10 years the secular shift. 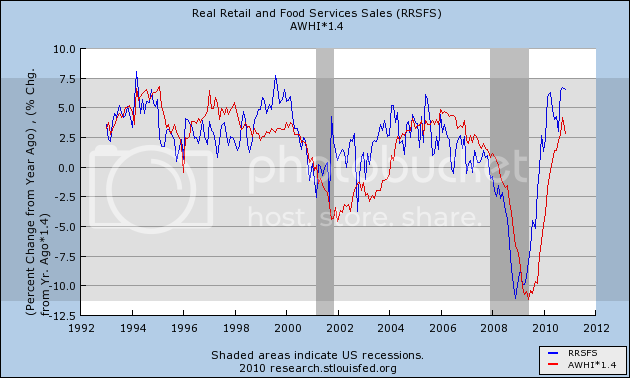 :Real retail sales maintains its status as a leading indicator, in this case for hours worked, and if anything the series fits more tightly than real retail sales vs. payrolls, with the exception of the dot-com boom and bust. P.S. I'm probably preaching to the choir here, but I hope posts like I've put up in the last week dispel any claim that I am an economic "cheerleader" or "Pollyanna." I started out with intellectual curiosity about the historical durations of 400,000+ jobless claims, was completely surprised by what happened when I normed those for population, and raw intellectual curiosity took over again from there. I go where the data leads me, it's that simple. It appears there is a slight secular trend higher in this metric in the long term. I will address this in point 4 below. (Note: my co- blogger Silver Oz has put this relationship together in a spreadsheet. If you would like a copy, let us know in the comments section). 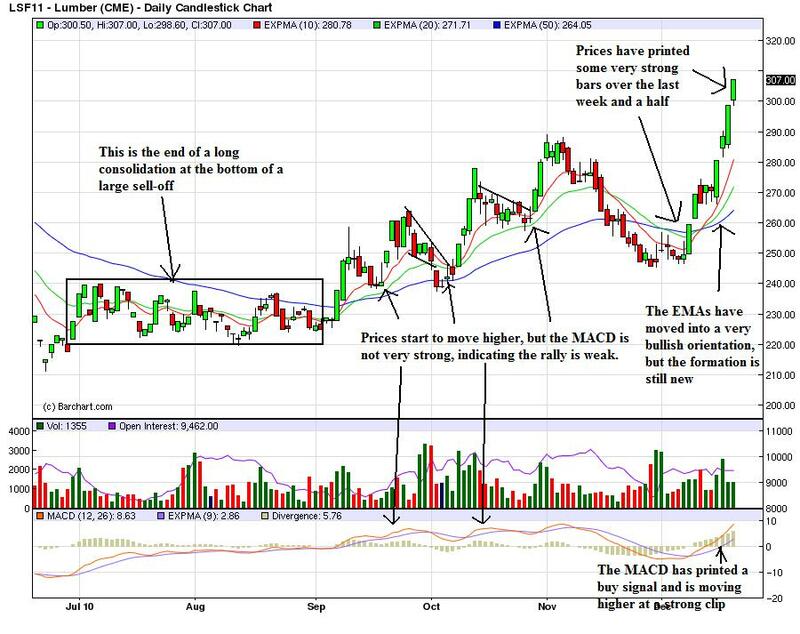 On Monday I showed an alternative, similar measure caclulated from the YoY change in the 6 month averages in the two metrics. Both ways of looking at the data show that this past year has been an exception to the rule: the unemployment rate has remained stubbornly high and unchanged even though initial claims have dropped by over 20%. On Friday I suggested that the exceptional circumstances prevailing now meant that layoffs were actually no longer higher than average for the last 50+ years. Rather, the issue was a lack of new job creation. 1. 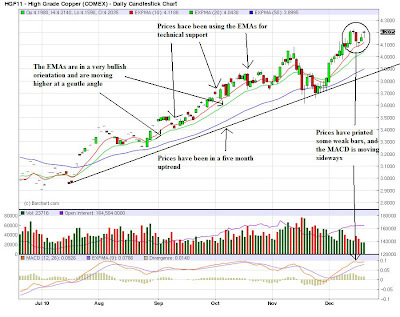 The expiration of the $8000 housing credit distorted the normal recovery pattern. Construction growth is not only failing to lead this recovery, but there has been no net construction hiring 19 months after the bottom of the economy. 2. In accord with number 1, and drastic cutback in fiscal aid to the states after one year has pushed job losses that would otherwise have taken place in 2009, into 2010, instead of renewed hiring beginning. 3. 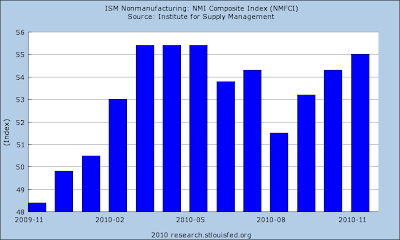 Manufacturing job growth is taking place in Asia in response to renewed American consumer demand. 4. Growth in hiring has been replaced with growth in hours. As part of the February 2009 economic stimulus package, Congress passed an $8000 housing credit. In response, housing sales and prices, both of which had been plummeting, stabilized and housing sales actually increased. 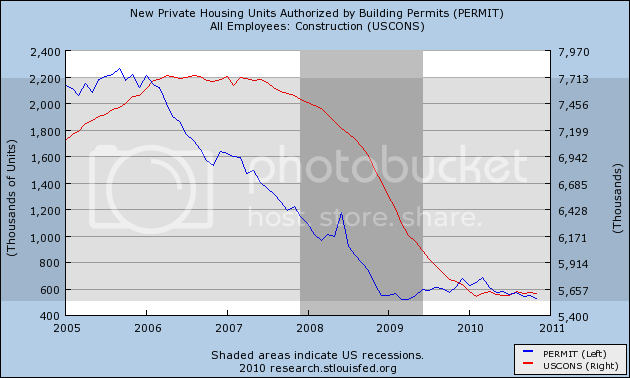 When the stimulus was originally planned on being terminated in October 2009, and then when it actually did terminate at the end of April 2010, housing starts and permits dropped again, all the way back to their previous lows, and decreased demand showed up in dropping prices as well. It is obvious they are still affecting it. 2. Of a piece with the housing stimulus is the saga of Congressional fiscal aid to the states, which was forthcoming in 2009, grudgingly and only partially extended for one more year in June 2010. State and local layoffs, which otherwise would have taken place in 2009, have taken place in 2010 instead. 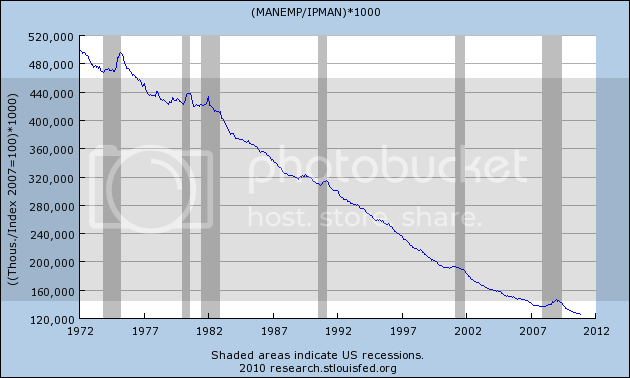 If you needed the reminder, here is the graph of local employment. Over 250,000 jobs in this sector have been lost. As to both housing and state and local government employment, what happened is a shift in layoffs. There would have been more layoffs and a steeper climb in the unemployment rate in 2009, and most likely a decline to where we are now this year. Instead the unemployment rate has flattened. 3. Another piece in the puzzle has to do with imports. Intermodal containers are typically the boxes that arrive via ship on the West Coast, and then are transported by rail to other locations. 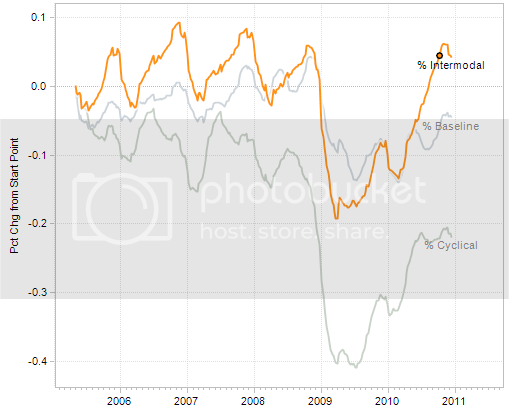 Although real retail sales have rebounded approximately 2/3 from their recession low, intermodal container imports and rail transit have made up essentially all of their lost ground. 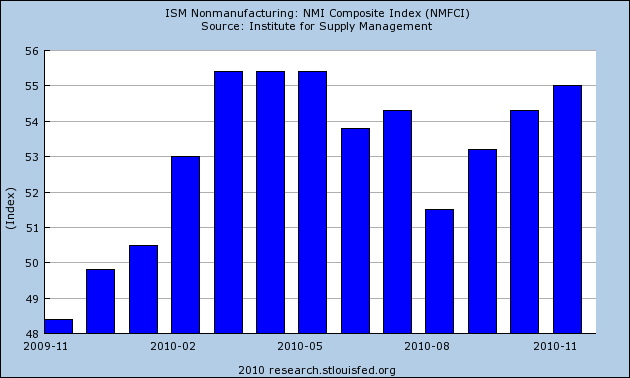 In other words, American cnsumer demand stimulated production in Asia, not manufacturing jobs in America. 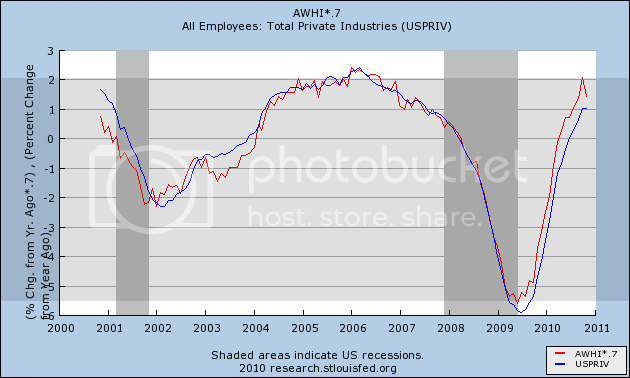 In short, this was a broad based drastic decline in jobs across the entire spectrum of the economy. 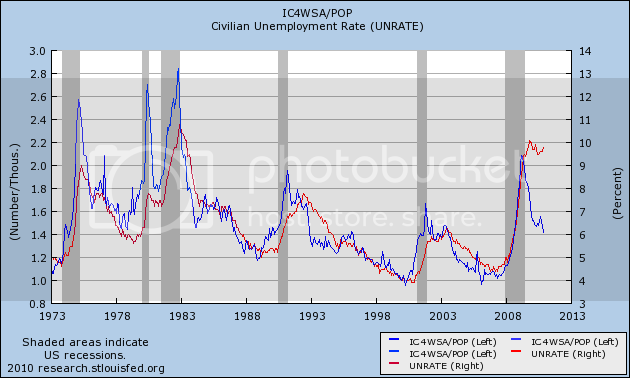 I submit that the Recovery in employment is taking place, relatively speaking, in the amount of hours worked, rather than in the number of jobs gained, and until that is resolved, metrics like the initial jobless claims rate (and real retail sales too) compared with employment and unemployment will lag compared to prior recoveries. And here are the more recent "jobless recoveries:"
As you can see, in earlier recoveries the number of hours initially grew faster than the number of jobs, but quickly reached a "saturation point" after which jobs grew just as fast. In more recent recoveries, the saturation point was very lately, if ever, reached. 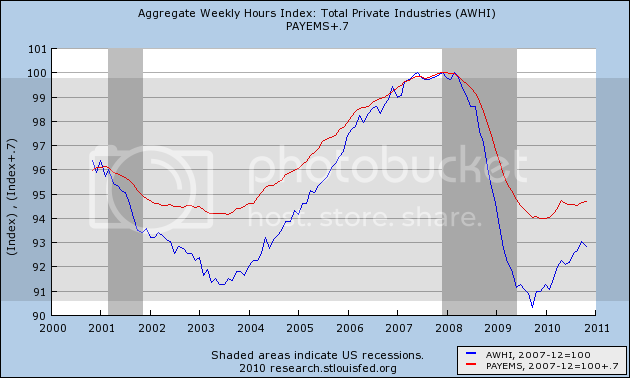 Let's now look at the actual growth in jobs and hours over time. 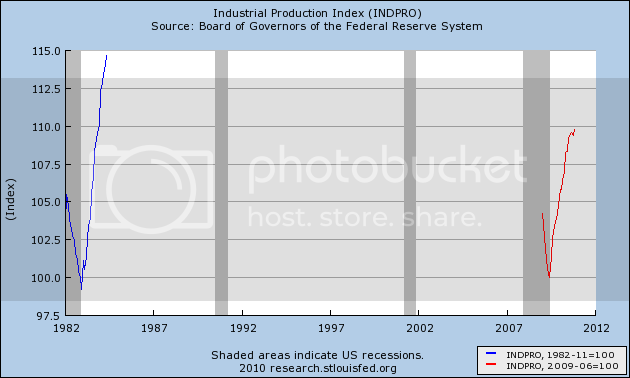 In this next graph, the last half century's data is normed so that the 1981 peak is at 100. 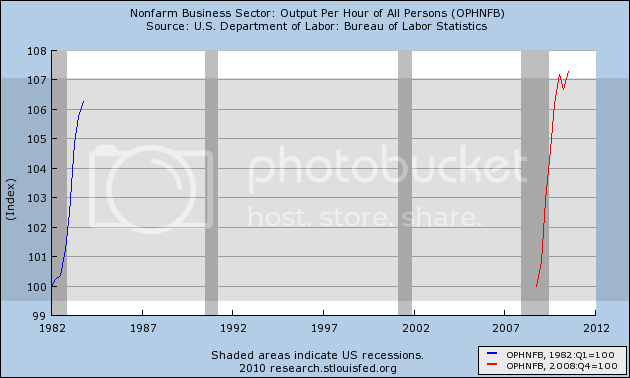 You can see that before then, jobs grew faster than hours. After that, the growth looks a little more equivocal. When we look at the same data over the last 10 years normed so that the 2007 peak is normed to 100, the change becomes much more obvious. 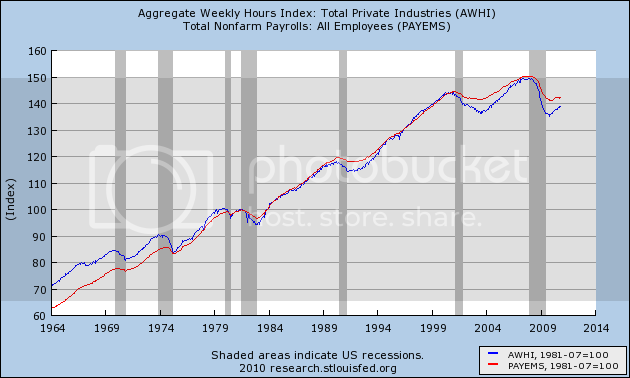 Since 1981, jobs and hours over the long term have grown about equally. 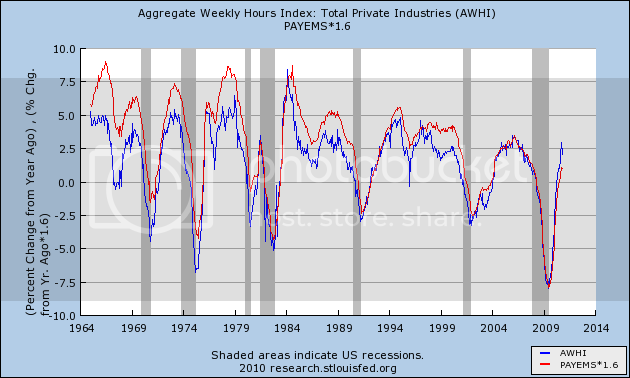 Hours decline more in recessions, and grow more in recoveries. In the Bush economy, the number of hours worked only caught up with the number of jobs gained in 2007 - just in time for the Great Recession. Since bottoming a year ago, half of the difference in the declines has been made up. 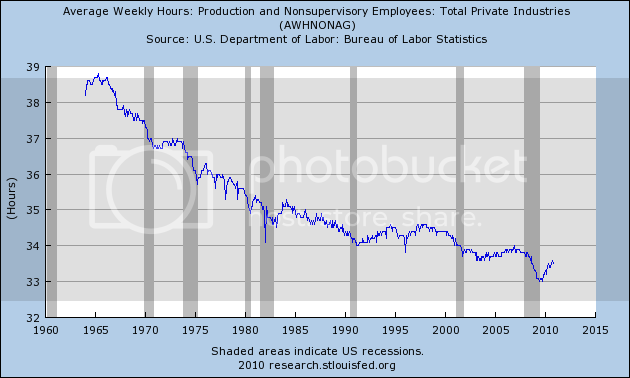 It is now easy to see that over time, fewer and fewer jobs were gained in economic expansions, and more jobs were shed during recessions, relative to hours worked. So let's put together the above 4 points into a conclusion. There has been a lag in job growth and unemployment decline compared with historical norms as to any number of metrics, including but not limited to the initial jobless claims rate and real retail sales. This is due in part to distortions due to the economic stimulus package of February 2009 which delayed and blunted losses in residential construction and state and municipal labor, which have continued to take place later than usual. In particular, one normal leading engine of recovery - residential building - is still bouncing along the bottom. Additionally, the rise of offshoring on a secular basis has meant that increased spending by Americans is, relative to past recoveries, stimulating job growth in Asia rather than in America. 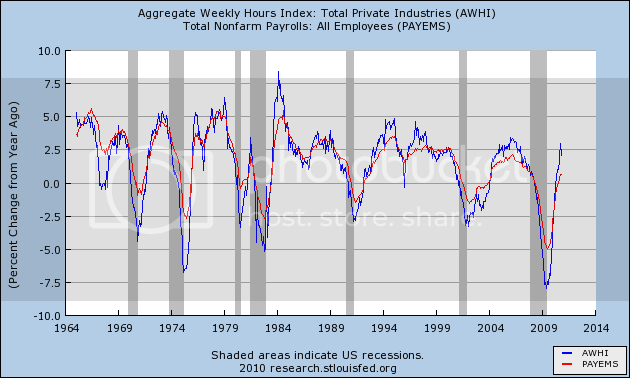 Finally, the secular reduction in average weekly hours worked in America means that there is much more slack to be taken up by growth in hours than by growth in jobs. This does not mean that the historical metrics aren't relevant. There are signs in things like architectural billings, rail freight related to housing, and prices for housing that in real terms are lower in some markets than at any point in the last 25 years - that suggest both residential and nonresidential construction may start to grow together at some point in the next 4-8 months. Additionally, if hours continue to regain lost ground relative to jobs at the same pace as they have in the last 12 months, then by about the end of next year hours will have caught up with jobs, and if we avoid another crisis we can expect job growth to accelerate. 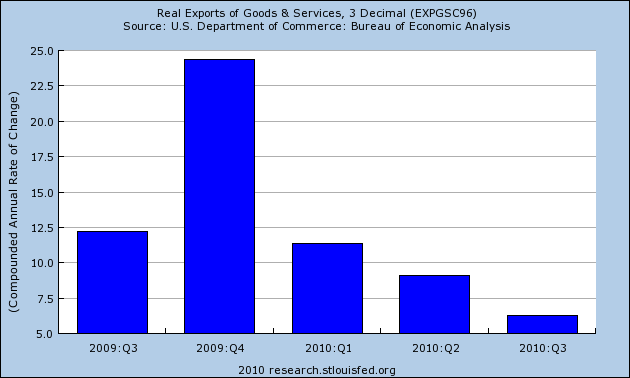 In short, the correlation may be delayed, but most likely it will assert itself in 2011. Reading economic blogs over the last year, it would be easy to get the impression the U.S. economy was mired in the worst depression of the last 200 years. For writers on the political right, any argument that makes the current administration's policies look terrible is to be used, regardless of its factual basis. Arguments from the left are based in a sense of betrayal; the new administration was not "progressive" enough; hence all progress that has been made is temporary or fleeting. And economic blogs -- most of whom correctly predicted the recession -- are still mired in a perma-bear mentality. Hence, all sides of the debate have a vested personal or ideological interest in seeing no progress at all, which explains why the mere fact the recession has been over for over a year now has been barely mentioned anywhere. But looking back on 2010, one trend stands out: despite the near continued prognostication of impending doom and imminent collapse around every corner, the U.S. economy actually continued to expand. Let's look at some of the details. Above is a chart of real GDP growth at a compounded annual rate of change. 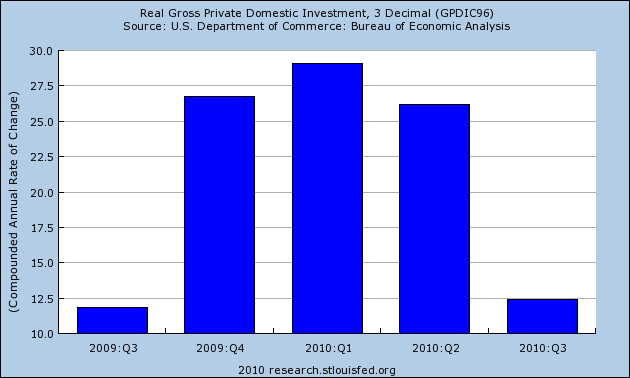 Here we see that top line growth has occurred for the last five quarters. The pace has slowed the last two quarters, but recent reports of retail sales and manufacturing activity indicated the the third quarter number will probably be revised higher. The median rate of top line growth for the first five quarters of this expansion is 2.5%. This compares with a 2.7% with the recovery that began in 1991 and 2% for the recovery that began in the first quarter of 2002. 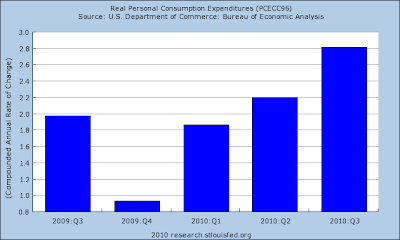 Consumer spending as expressed by real PCEs has been increasing for the last five quarters. Also note the pace of spending has been increasing, with the compounded annual rate of change moving from a little over 1.8% in the first quarter to 2.2% in the second quarter to 2.8% in the third. Retail sales -- a subset of PCEs, have been on fire for the last four months, increasing at a strong annual rates. Real investment has also been increasing, rising strongly from the 4Q09 to 2Q10, and then increasing at a compounded annual rate of 12.5% last quarter. And while the U.S. is still a net importer (which subtracts from overall growth) total exports are still increasing at a compounded annual rate, and have been over the last five quarters. While the pace of the increase is declining, it is still over 5% on an annual basis. Lets take a look at manufacturing. 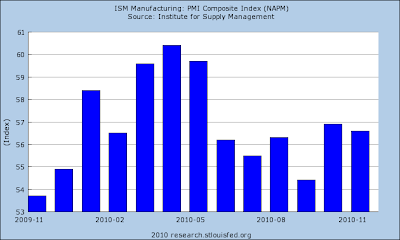 The ISM manufacturing index has registered over 50 for the entire year, indicating the manufacturing sector is expanding. 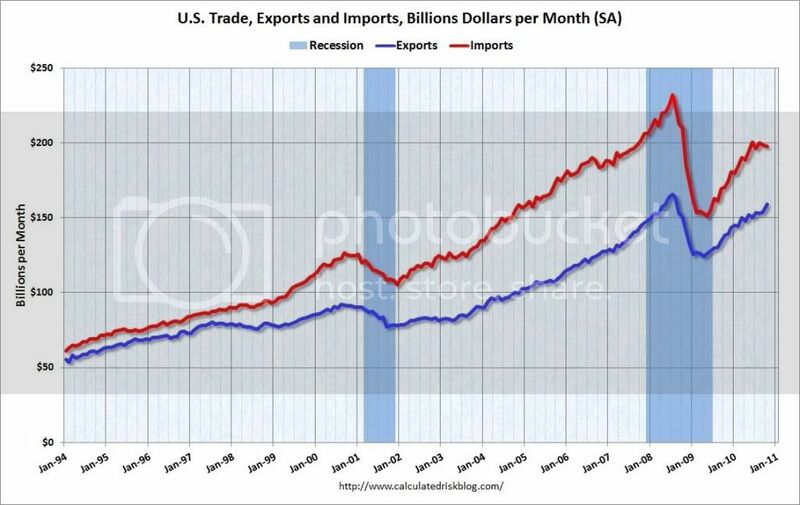 This is one reason for the increase in exports seen above. 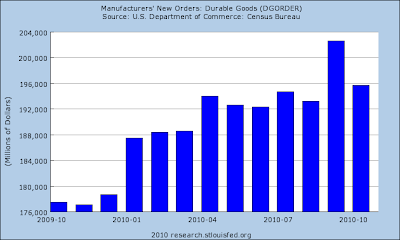 Total new durable goods orders are in a clear upward trend. While the pace has slowed, this is a common trait with this data series -- that is, month to month it can be volatile. Industrial production is also in a clear upward trend, although the pace of increase has slowed. And capacity utilization is also moving higher, although the pace of increase has been slower over the last few months. While there are far fewer indicators for this section, we see the ISM service sector index has been above 50 for the last 10 months. In addition, the pace of expansion has been increasing. There are two areas that are still the economic "problem children:" real estate and employment. 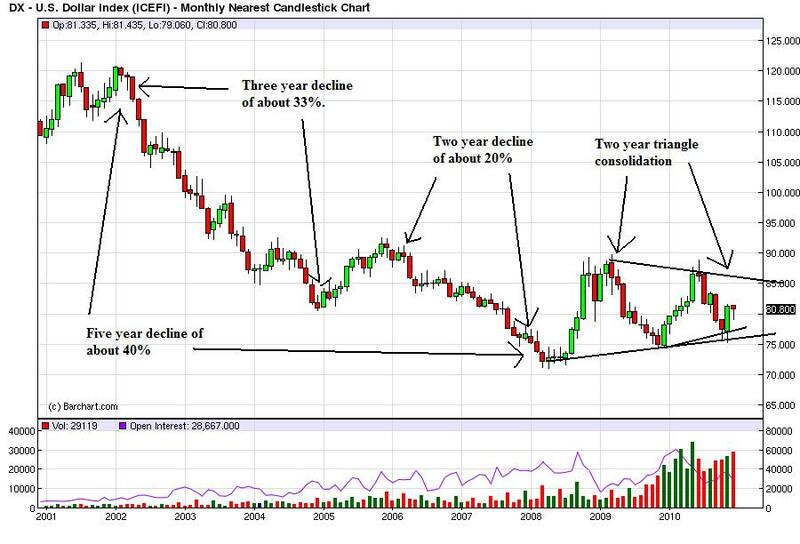 Real estate will probably be a problem throughout 2011, although there is an outside chance we'll see a bottom sometime over the next 12 months. 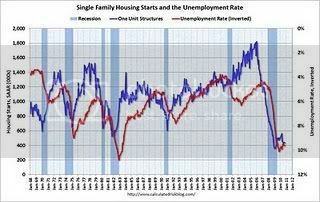 Lumbers futures recent strong advances may signal housing starts are about to increase. And while the employment situation is terrible, the unemployment rate and initial jobless claims are behaving in a manner similar to the last two recoveries. 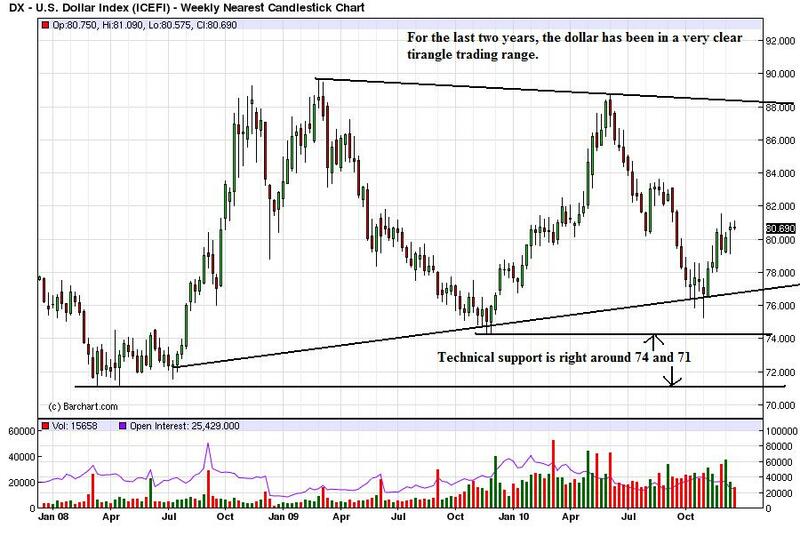 In short, the calls for impending doom that we've seen and heard for the last twelve months have been wrong. 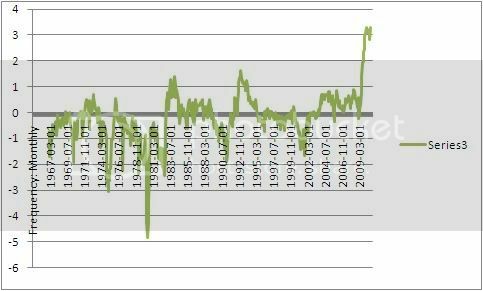 This is the second part in a comparative look at our recovery versus the recovery from the 1981 recession that I began examining with this diary back in March of this year. The first part of this comparison looked at employment growth coming out of each recession and some productivity concerns that I have regarding our ability to grow demand at a pace fast enough to outstrip the current exponential explosion in productivity growth. This part of the comparison will look at some of the indicators that show how close this recovery is to the strength of the recovery from the 1981 recession and how in a few areas we are even ahead of that recovery. I first want to begin by looking at the private sector as related to stock market performance and corporate profit growth. This recovery has been extremely strong in those measures and exceeds even the incredibly strong growth in these measures from the recovery from the 1981 recession. 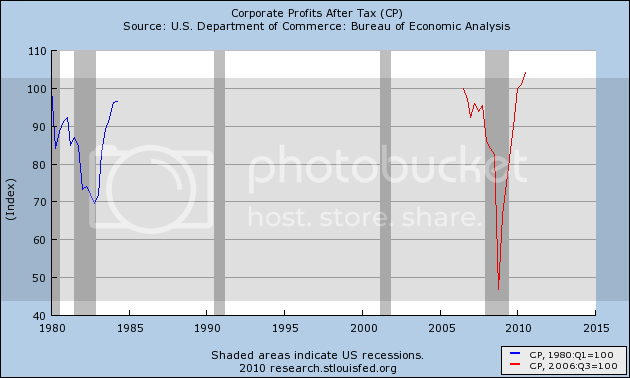 I have indexed the corporate profits back to the peak prior to the recession (since the 81 recession was a double dip, I took it back to the peak from just prior to the 1980 recession). 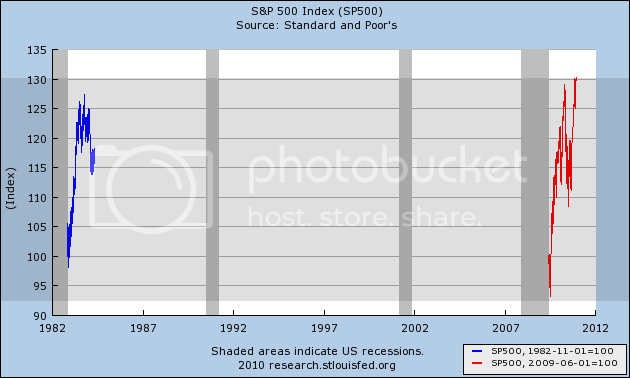 And for the stock market graph, I indexed the S&P 500 to the end of the recession (as opposed to the trough so as not to let our extremely low bottom skew the data). 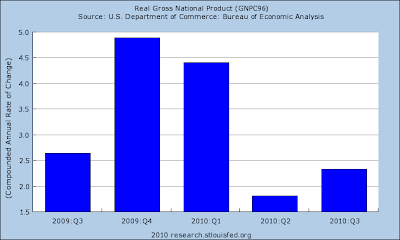 As you can from these graphs, in the corporate profits and stock market, this recovery has been incredibly strong, but again much of these profits can be traced back to the job cuts and productivity gains that were undertaken during the recession. However, as long as growth continues and productivity remains high, it is likely that at least the corporate profits chart will remain on an upward trajectory (I will not make any stock market prognostications here however). 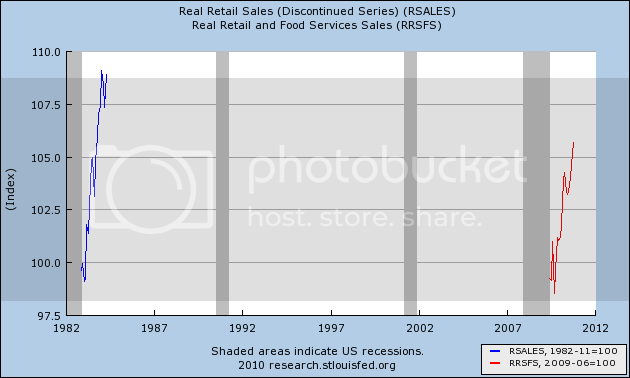 Also, while lagging the recovery from the 1981 recession, the current recovery is still fairly strong in terms of real retail sales and industrial production as can be seen below, while definitely lagging in capacity utilization (another harbinger of our productivity gains). 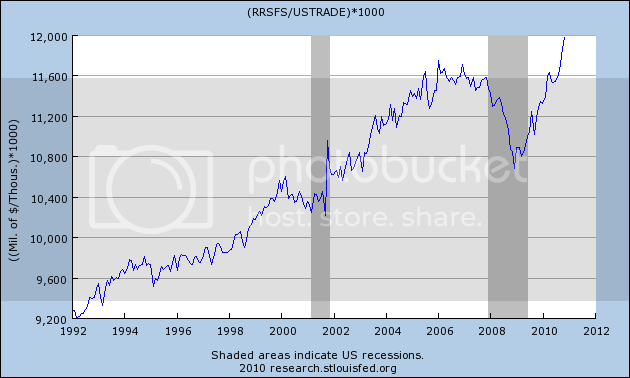 Note that while our retail sales do lag the 80's recovery, they appear to be accelerating again at a pace that is very similar to the 80's recovery after a couple of pullbacks earlier in our recovery. 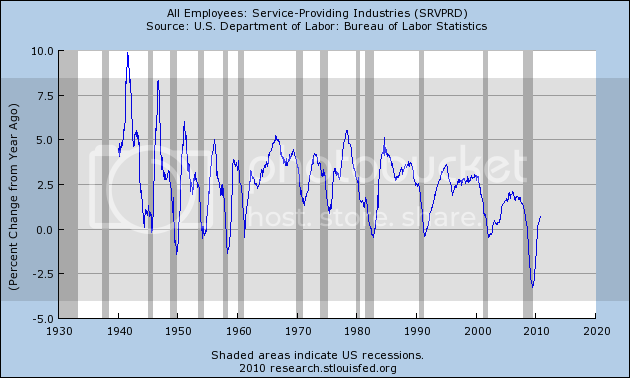 So, while our recovery is definitely not as strong as the recovery from the 1981 recession (especially in terms of job creation), it isn't that far off in other measures and is actually outperforming that recovery in the corporate sector of the economy. I'm going to try something different for the next few weeks. 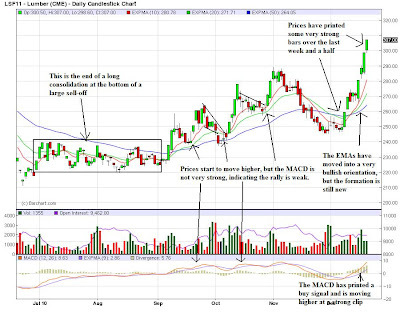 Instead of offering commentary on the charts below them, I'm going to do all the commentary on the charts themselves. 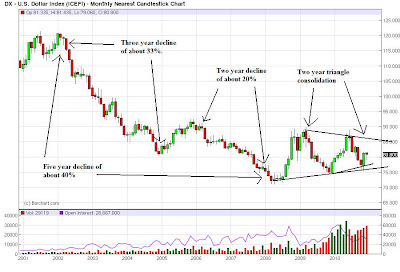 So, click on all the charts for a larger image and then let the annotations do the talking. Please feel free to comment whether you like this or not. 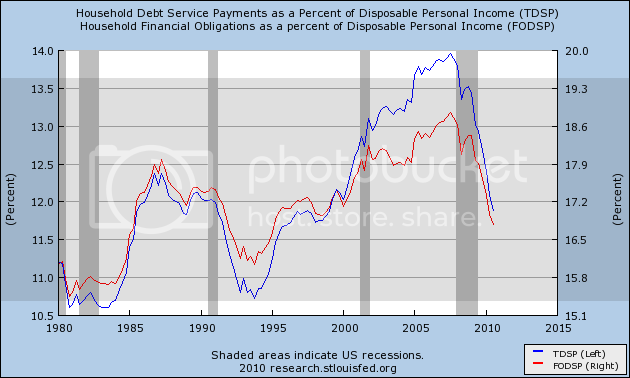 Debt service payments (blue line) are now less than most of the last 30 years. Total financial obligations (red line), are now less than all but the early 1980s and 1990s - i.e., less than more than 2/3's of the last thirty years. If this rate of decline continues, then by 6 months from now, households will have lower debt burdens than at any time since the early 1980s - in other words, they will be at a 25 year low. Recently, a few pundits have made the argument that households weren't actually cutting their debt at all, based on bank charge-offs and foreclosures. 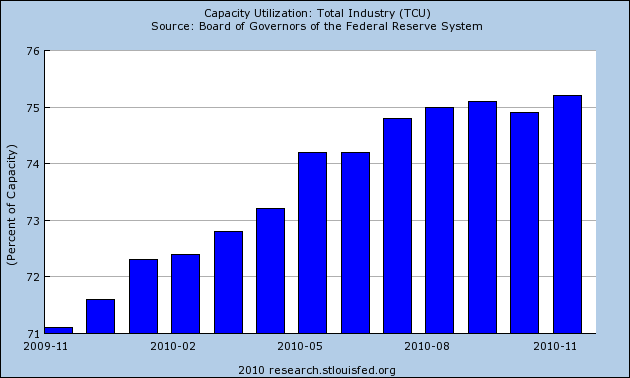 Since its peak in the third quarter of 2008, nearly $1 trillion has been shaved from outstanding consumer debts. $300 billion annually to consumers’ cash flow. Excluding the effects of defaults and charge-offs, available data show that non-mortgage debt fell for the first time since at least 2000. Also, net mortgage debt paydowns, which began in 2008, reached nearly $140 billion by year end 2009. These unique findings suggest that consumers have been actively reducing their debts, and not just by defaulting. “Consumer debt is declining but only part of the reduction is attributable to defaults and charge-offs,” said Donghoon Lee, senior economist in the Research and Statistics Group at the New York Fed. 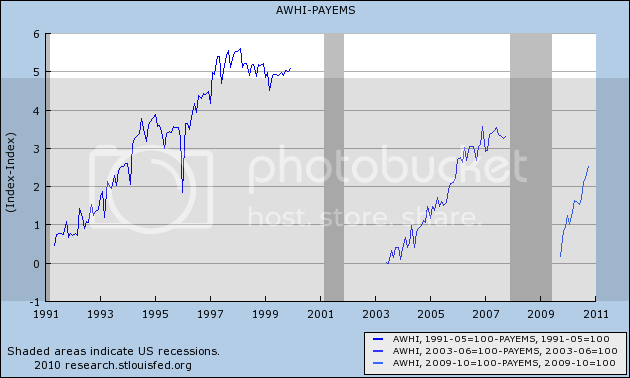 “Americans are borrowing less and paying off more debt than in the recent past. There was a surge of refinancing as mortgage rates fell to 4%. Somebody who, for example, had a 6% mortgage, and refinanced at 4%, instantly lowered their mortgage payment by 1/3 - even though the overall debt remained the same. Furthermore, it appears that about 1/3 of all mortgage refinancings during the third quarter included additional paydowns of mortgage balances as well. When people wonder how we can have both increased saving, and increased spending, this is the answer. A while back I wrote a diary comparing and contrasting the recovery from the 1981 recession to ours and highlighted some of the economic reasons why we were able to have such a strong recovery back then and why we lacked similar compelling reasons for a strong recovery today. Since that diary was published, our current recovery has continued (and may even be accelerating) and it now looks to be the strongest recovery since the end of the 1981 recession (except for the continued weak job creation numbers). This diary will attempt to highlight the strength of our current recovery with the recovery from the 1981 recession at a similar point removed from the trough and will again point out some of the deficiencies in job creation and growth catalysts between our recovery and the recovery from the 1981 recession. I have divided the diary into several posts, with this first one taking a look at employment. First, let's get employment out of the way. 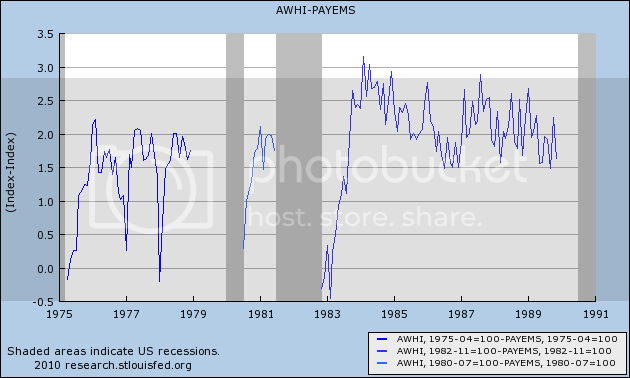 Payroll growth has frankly stunk so far in this recovery and we can get a good look at how bad it has stunk when we compare it to the recovery from the 1982 recession (also keep this graph in mind as you read the rest of the post). 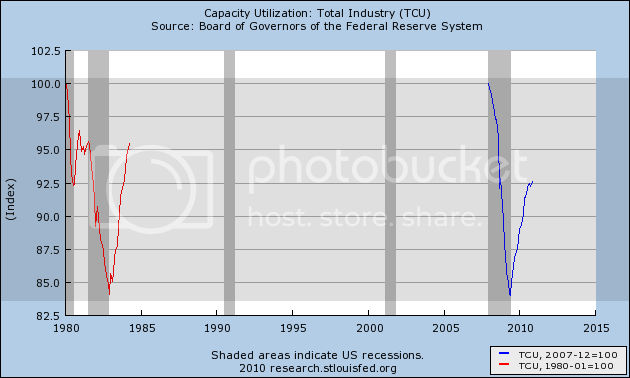 In other words, we simply need less labor input for a greater level of production than we have in the past and this productivity growth is increasing at a rate that is greater than the growth rate in demand required to actually create new jobs (or at least at a rate that is not fast enough to absorb the losses from the recent recession at a pace that is desirous). 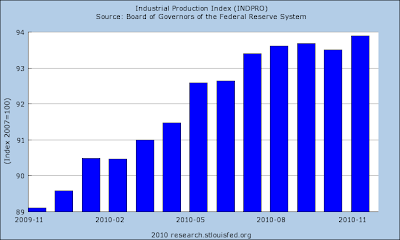 The question we must ask is at what point do these productivity gains slow down enough to allow for significant job creation or have we reached a point where the productivity gains will continue to grow at a point that retards job growth a limits our ability to have a robust jobs recovery.